As an administrator, you can set up email notifications to be sent out when a form is completed. You can send the notification to the user who completed the form, to other users in the account, or even to email addresses outside of the GoFormz account. This can be useful for record-keeping, and fostering collaboration with others in your organization. Important note: This article is about setting up email notifications across all templates in your account. See here if you want to set up automatic email notifications for individual templates. 1. Navigate to your account Settings page. 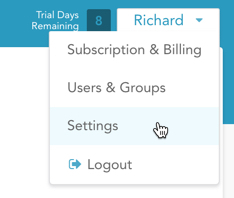 Click your username in the top right corner to expand the account management dropdown, then select Settings from the dropdown. 2. Navigate to the email setup screen. Click Auto-Email from the list on the left. You will see the current auto-email settings. To email the user who completed the form, check the User who completed form checkbox. 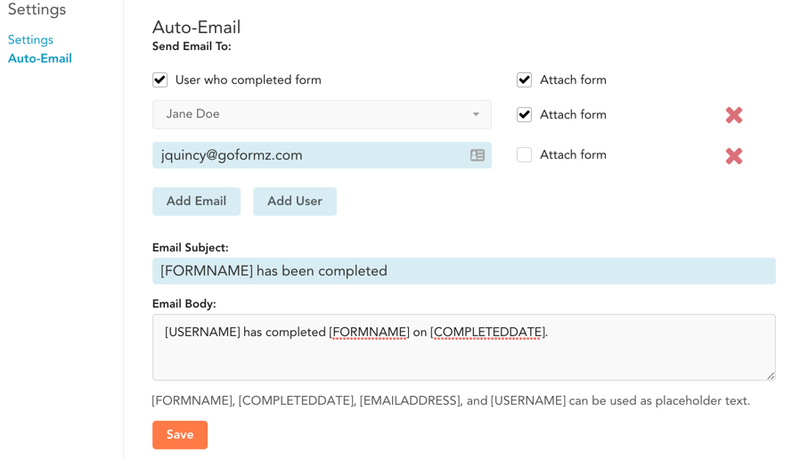 To email a specific user in your GoFormz account, click the Add User button and select the user’s name from the dropdown. To email someone outside of your GoFormz account, click the Add Email button and type in the email address. In the example below, we use all three options. To remove a user from the recipient list, click the X icon to the right of their name. 4. Select form attachment. For each user on your list, use the Attach form checkbox to select whether a form PDF attachment should be included with their email. In the example below, we send the attachment to two of the three users. 5. Enter the email subject. Fill in the text that you want to appear in the email’s subject line. This field supports GoFormz Variables. The form name is included by default via the [FORMNAME] variable, but you can modify the text to suit your needs. 6. Enter the body of the email. Fill in the text that you want in the body of the email. This field also supports GoFormz Variables. 7. Save your changes. Click the Save button at the bottom of the page. Once you complete these steps, users will start receiving notification emails upon form completion. Note that by default these emails will come from no-reply@goformz.com, and the GoFormz email server will be used to send them. See here for instructions on how to specify your own SMTP email server for these notification emails, along with a custom From email address, etc.